As soon as they came to the fishing ground, they baited their hooks and threw the lines into the water. When the fishing lines touched bottom, Chief Cormorant had a bite from a halibut at once, and hauled up his line with a halibut at each end. He clubbed them and took them into the canoe. The old coastal Tsimshian villages were often situated near deep-water banks where halibut were abundant in spring. Fishermen caught them with hook and line and killed them with yew-wood clubs. The fish were too strong, vigorous, and large – up to three hundred pounds – to bring into a canoe safely while still alive. 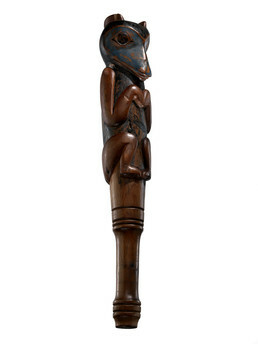 Artist David Boxley identified the figure carved on this Nisga’a fish club as a wolf. Clubs were also used to kill salmon as they swam in shallow streams.